Baptism, the Sacrament of Initiation into the Christian Community, is celebrated during Sunday worship when the gathered community is present to welcome the baptized person into the church family and to pledge to support his or her growth into full Christian discipleship. We baptize at any age. 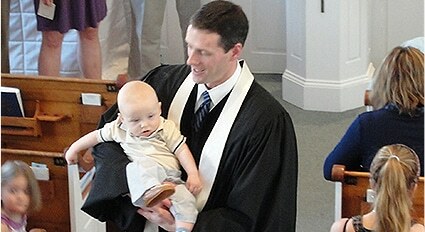 When a child is baptized, the parents make promises on the child’s behalf. When an older youth or adult is baptized, they make promises for themselves. Although some parents choose godparents for their child, in many instances the entire congregation serves as a community of godparents. The Sacrament of Holy Communion, also known as the Lord’s Supper, takes place on the first Sunday of each month. When we celebrate communion, we remember the life of Jesus, especially the last supper he shared with his disciples. All are invited to share at the table. Following the example of Jesus, we welcome everyone – children and adults, members and non-members, doubters and believers, sinners and saints. 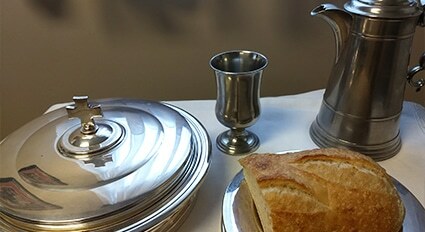 Loaves of bread and cups of grape juice are served to all as they remain seated in the pews. Communion is celebrated at the beginning of the service so that the children and youth may participate before they leave for Sunday School.